The Alabama Department of Labor has begun enforcement of the Employer New Hire Reporting Law. To avoid citations, please review your records and report all newly hired (not previously employed or previously employed but has returned to work after being separated for 60 consecutive days) or recalled employees within the last 12 months from the current date. Failure to report new hires in the future may result in the assessment of the $25.00 penalty per occurrence. You may file all New Hires HERE. eGov (Electronic Government Services) is an online, Internet application area inside the Alabama Department of Labor web site. Its purpose is to provide employers and citizens of Alabama new avenues for delivering and receiving information important to their success. Who can use the eGov application area? Currently, only employers can sign in to the application area. This will change in the future to include applications pertinent to citizens as well but, at this time, the eGov application area only contains tools for employers. 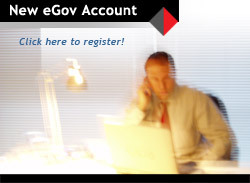 How do I apply for my eGov Account? To receive access to the Alabama Department of Labor eGov application area, simply click here or on the New eGov Account graphic. You will be able to choose your own login user id and password. Alabama Department of Labor will collect basic employer information that will aid in accessing available applications. Note: Browser cookies must be enabled to use the eGov area! Click here to view step-by-step instructions for Internet Explorer 11 (example only - refer to your browser documentation for detailed instructions). Help me - I can't log into my account! What applications are available in eGov? Register for a state unemployment insurance (SUI) account number (Form SR-2, Application to Determine Liability), change your UC Employer mailing address, or view the UC Account Summary. File a quarterly unemployment compensation report, Forms UC-CR-4 and UC-10-R, both as an individual or as a third party filer with Power of Attorney (POA) on file with this Department, or bulk file as a third party filer with POA. See Upload and Bulk File Formats Here! All employers, Tax Rated and now Reimbursable (NEW), are required to pay amounts due to this agency via Electronic Funds Transfer (EFT) - Ref: Administrative Rule No. 480-4-2-.17. This system is safe, secure and allows flexibility in payment options at no cost to the taxpayers. Tax Rated employers' Tax Rate Notice will be available for download no later than January 31 of the same calendar year in which they are effective. Reimbursable employers' Advanced Payment Rate Notice will be available for download no later than April 1 of the same calendar year in which the new fiscal year begins. Forms CR-4 N (Notice of Payment Due), CR-4 G (Report of Payment to Unemployment Compensation Trust Fund Governmental Employer) and UC-212-G (Annual Statement of Advance Payment Account Governmental Employer) available for download. Forms UC-212 (Experience Rating Charges) and UC-212-A (Statement of Benefit Cost) available for download. View a listing of former employees who received an unemployment check within the last 180 days. Return information requested for an unemployment compensation claim. Want to Lower Your Tax Rate?